Why is this called "Sunflowers" and there is not one such flower in sight? Because it began as a 6 x 12 inch canvas, commissioned by a co-worker when I lived in Montréal. She wanted something with sunflowers. The bottom half of the painting had me going all expressionistic with blazing, stylized yellows. It was a breakthrough moment, however, the manner and colors simply did not work with the rather sublime, imagined landscape. 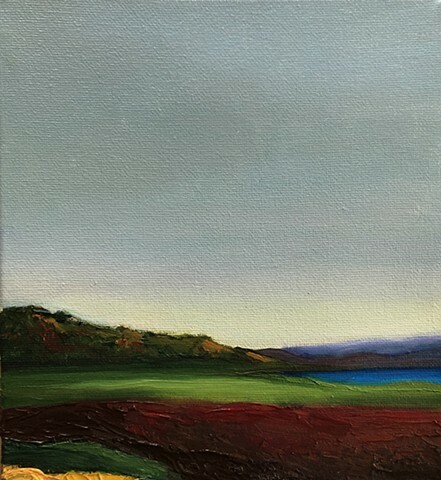 Fast forward to years later, I'm now living in Utah, readying for an art fair, and the 6 x 12 became a 6 x 6. Remnants of the yellows are still visible on painting's bottom edge. My co-worker selected a painting of a singular sunflower and resides with her just north of Montréal.